Bayern announced the acquisition of point guard Stefan Jovic from Crvena Zvezda, who signed a deal that will keep him with a new team until the summer of 2019. 26-year-old Jovic averaged 7.5 points and 5.6 assists in 23 EuroLeague games for Zvezda last season with Zvezda. In his three years with the club, Jovic helped the team win three Adriatic League titles, three Serbian League trophies and a pair of Serbian Cups. 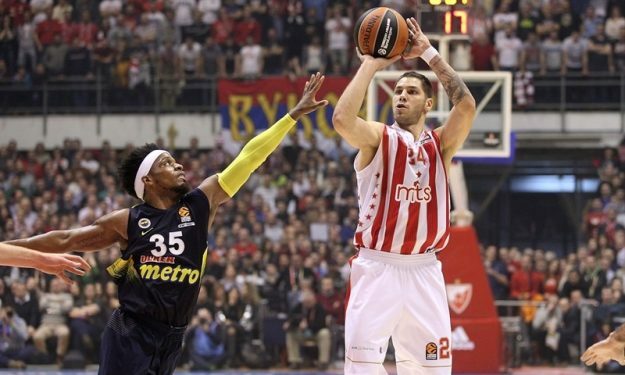 Jovic also helped Zvezda reach the EuroLeague playoffs in the 2015-16 season, in which he set the competition’s all-time single-game assists record by dishing 19 in a road win against Bayern. He ranks 5th all-time with 4.88 assists per game, and is 6th on the all-time charts among qualified players with 2.61 assist-to-turnover ratio. He is also a regular with the Serbian national team, which he helped win respective silver medals at the 2014 FIBA Basketball World Cup and the 2016 Olympics. Jovic started his career with Zdravlje Actavis Leskovac and also played for Sloga Kraljevo and Radnicki Kragujevac. He played his lone EuroCup season with Radnicki in 2013-14, when he averaged 3.9 points and 3.1 assists in 13 games.